Explanation: Yes, but can your meteor do this? 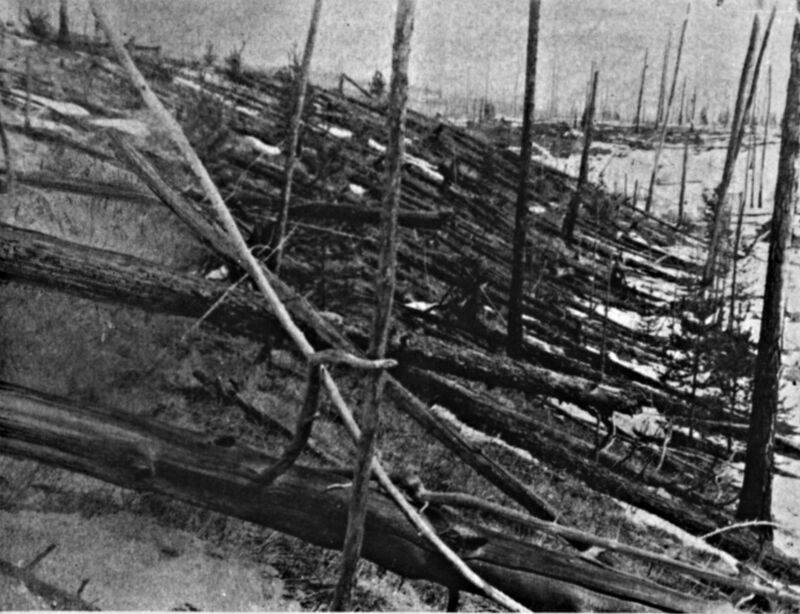 The most powerful natural explosion in recent Earth history occurred on 1908 June 30 when a meteor exploded above the Tunguska River in Siberia, Russia. Detonating with an estimated power 1,000 times greater than the atomic bomb dropped over Hiroshima, the Tunguska event leveled trees over 40 kilometers away and shook the ground in a tremendous earthquake. Eyewitness reports are astounding. The above picture was taken by a Russian expedition to the Tunguska site almost 20 years after the event, finding trees littering the ground like toothpicks. Estimates of the meteor's size range from 60 meters to over 1000 meters in diameter. Recent evidence suggests that nearby Lake Cheko may even have been created by the impact. Although a meteor the size of the Tunguska can level a city, metropolitan areas take up such a small fraction of the Earth's surface that a direct impact on one is relatively unlikely. More likely is an impact in the water near a city that creates a dangerous tsunami. One focus of modern astronomy is to find Solar System objects capable of creating such devastation well before they impact the Earth.